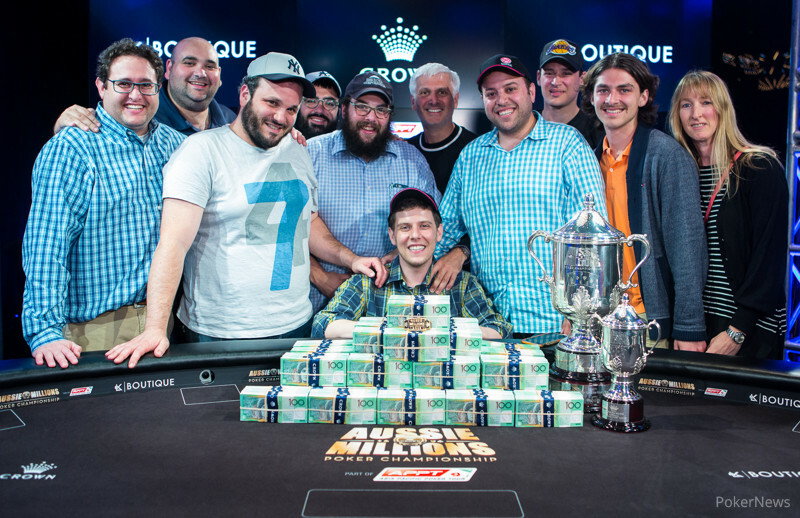 Congratulations to Ari Engel, Winner of the 2016 Aussie Millions Main Event for $1.6 Million! 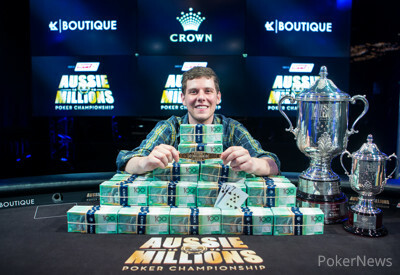 What an unbelievable way to end an absolutely epic event,, and with that Ari Engel has become the 2016 Aussie Millions Main Event champion! Engel's AU$1.6 million victory came at the end of a hard-fought heads-up battle when Tony Dunst attempted to make a tough hero call to double up. Unfortunately for Dunst, his fourth pair was no good against Engel's top pair and he had to settle for a second-place finish worth AU$1 million. For Engel, the win marked the most remarkable one of his career, but he's certainly no stranger to success. A Canadian that regularly travels the poker tournament circuit across the globe, spent eight early years of his life living in Melbourne, Australia. His travels returned him to the city for the 2016 Aussie Millions and it's all come full circle thanks to this impressive victory. Engel can now add the bracelet to his trophy case and smile from ear to ear with the huge payday he earned. At the start of Sunday's final table, seven players remained from a starting field of 732 — the fourth-largest Aussie Millions Main Event in its 19-year history. First to go was Australia's own John Apostolidis, and he was followed out the door by one of two female players to reach the final table, Kitty Kuo. Apostolidis took home AU$210,000, and Kuo scored AU$270,000. The next two places on the payout sheet were filled in by two more Australian's. First it was Dylan Honeyman falling in fifth place for AU$340,000, and then Alexander Lynskey took fourth for AU$445,000. For Lynskey, the run to the final table was extra sweet after he suffered a heartbreaking result in last year's Aussie Millions Main Event. He took a severe beat late in the event and ended in ninth place after promise showed he was ripe for the final table. Along with the aforementioned Kuo, Samantha Abernathy was the other woman at the final table, and she advanced into the tournament's last trio of players. While she held her own throughout the day, the big stacks ofEngel and Dunst proved too much to overcome. In the end, she moved all in with ten-eight and lost to Engel's ace-nine. Dunst entered the heads-up duel with the lead, and what a duel it was. The first five eliminations of the final table took 92 hands of play, but heads-up play took 123. Over the course of a few hours, Dunst and Engel traded blow after blow, but it was Engel's punches that were landing with a bit more power as he ground his opponent down. But then, on the 203rd hand of the day, Dunst doubled back to just about even before the two headed into a 45-minute dinner break. When the couple returned to action, it didn't take long for Engel to go right back on the offensive in a big way. He made an impressive call with fourth pair to pick off Dunst's five-high bluff, and this proved an interesting hand as it was then Dunst who eventually called off his stack incorrectly with four pair to lose out. For Dunst, a cool seven-figure payday will help him wake up with a smile in the morning, but the spotlight tonight is all about Engel. "Thanks so much," Engel said with a smile upon receiving congratulations after his way. "It feels awesome!" Hand #215: Dunst started on the button and raised his to 325,000. Engel found the and three-bet to 925,000. Dunst made the call to see a flop come , and Engel, with nothing really, bet 825,000 into the pot of 1.9 million. Dunst, having flopped middle pair, made the call. The on the turn gave Engel the best hand, and he fired 1.7 million. Dunst made the call pretty quickly, and off to the river they went. The fell on the end, and, with 6.8 million in the pot, Engel shoved all in for effectively 6.1 million. Dunst tanked long and hard, and the more he thought, the more it became apparent that something was telling him Engel was up to something. After all, Dunst had just fourth pair on board. Eventually, Dunst made the call, but all he could do was muck his hand upon seeing Engel's pair of jacks. Dunst, who spent several years of his life living in Melbourne, Australia, earned AU$1 million for his runner-up finish, which was better than his previous best score of $452,729. Hand #211: On the first hand back from the dinner break, Tony Dunst had the button with the and raised to 325,000. Ari Engel called with the , and the flop came down . Engel checked, Dunst bet 300,000, and Engel called. The turn was the , and Engel checked. Dunst bet 750,000, and Engel made the call to see the land on the river. Engel checked, and Dunst fired 1.8 million. Engel tanked for quite some time, checked his hand one more time, and eventually made the call. Dunst showed the 5-high and Engel took down the big pot. "That was impressive!" commentator Jason Somerville said. Hand #212: Engel raised to 350,000 with and Dunst called with . They took a flop of and Dunst check folded to Engel's 350,000 bet. Hand #213: Dunst on the button raised to 325,000 with and Engel called with the from the big blind. Dunst flopped a straight on and his bet was enough to take it down. Hand #214: Engel on the button made it 350,000 holding . Tony Dunst called with the and they took a flop of . No pair for anybody and Dunst checked. Engel bet 325,000 and Dunst, with his gutshot, check called. The on the turn saw both players check and the completed the board. Dunst bet out 750,000 and Engel folded his queen-high. Play has resumed between Tony Dunst and Ari Engel. The players are on a 45-minute dinner break. Hand #204: Ari Engel raised to 320,000 with the on the button, and Tony Dunst three-bet to 860,000 with the out of the big blind. Engel folded. Hand #205: Engel raised on the button to 320,000 with the . Dunst reraised from the big blind with the to 860,000, and Engel folded. Hand #206: On the button, Engel raised to 350,000 with the . Dunst called with the , and the flop came down . Dunst checked, Engel bet 375,000, and Dunst folded. Hand #207: Dunst raised to 325,000 on the button with the , and Engel called with the . 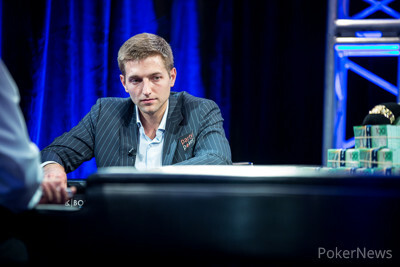 The flop was , and Engel check-folded to a bet of 350,000 from Dunst. Hand #208: Engel made it 350,000 to go on the button with the , and Dunst folded the from the big blind. Hand #209: Dunst raised to 325,000 with the , and Engel called with the to see the flop come down . Engel checked, Dunst bet 325,000, and Engel folded. Hand #210: Engel raised with the to 330,000 on the button, and Dunst called with the to see the flop. Dunst check-called a bet of 375,000 from Engel, and then the two checked the turn and river. With a pair of threes, Dunst won the pot. Hand #202: Ari Engel had the button and the . He raised to 350,000, and Tony Dunst called with the . The flop was , and Dunst check-called a bet of 300,000 to see the land on the turn. Both players checked, and they also checked the on the river. Although both players had ace high, Engel's kicker played and he was the winner. Hand #203: Dunst raised to 325,000 on the button with the , and Engel called from the big blind with the to see the flop come down . Engel checked, Dunst bet 250,000, and Engel called. The turn was the , and this is where things can really interesting and really excited. After Engel checked, Dunst bet 600,000. Engel took a few moments and then check-raised all in. Dunst, who had a little over 4 million behind, went into the tank. Although he had top pair, Engel had put him in a tough spot. After a bit, Dunst opted to make that call and saw that he needed to dodge a plethora of outs to stay alive. The river was the to give Dunst the double, and he pulled just about even with Engel. Hand #197: Dunst opened the button, Engel three-bet and Dunst four-bet to 2 million with pocket queens. Engel had jack-nine and folded. Hand #198: Engel had on the button and raised it up to 350,000. Dunst made the call holding . on the flop and Dunst check folded to Engel's 365,000 bet. Hand #199: for Dunst on the button and he raised to 325,000. Engel defended holding . The two got a flop of and Engel check folded to Dunst's 300,000 continuation bet. Hand #200: Ari Engel was first to act and he folded his , giving Dunst a walk. Dunst had the only hand worse; deuce-trey. Hand #201: Dunst on the button made it 325,000 holding . Ari Engel had the better ten and called with the . The flop came diminishing Dunst's hand to just a 4% hand. Engel check called a bet of 375,000 and the hit the turn. Engel checked called another 925,000. With the pot now at 3.3 million the completed the board. 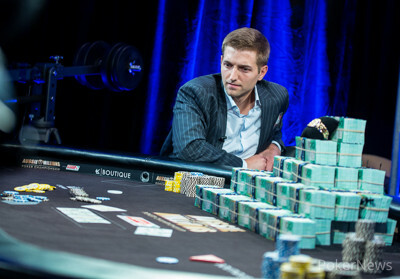 Engel checked again and Dunst bet a hefty 2.4 million. Engel tanked for some time and eventually called and took it down as Dunst showed nothing but 10-high. Who'll Win the 2016 Aussie Millions Poker Championship Main Event?